Elections are being held on 2nd May (or before for postal voters). Please remember that these are nothing to do with the confusion and bewilderment of Parliament or the "B word", but are for local council elections. In other words, voting for people to represent Cotgrave on the local council (Rushcliffe Borough in my case). B****T really is not my fault! I have been one of Cotgrave's borough councillors since 2003 helping individuals and the area as a whole, and hope very much that Cotgrave residents will vote for me and my two colleagues, Leo Healy and Christine Jeffreys, so that Cotgrave can continue to receive investment and regeneration from and via Rushcliffe Borough Council. The main opposition (Labour) voted unanimously against the recent Rushcliffe Budget to invest an additional million plus pounds in the shop area regeneration and over a hundred thousand on improvements to the Manvers and Cotgrave business parks. You can find out more about us on the Cotgrave Conservatives website. Thank you. As your county councillor I get involved with lots of meetings and events involving our area, but also deal with resident and constituent queries and case loads. I like to and need to know what people think and want councils to try to do. I am here to listen and represent your views, so please let me know if you have any queries. You can contact me via this site or email. Or call (0115) 989 2504 or mobile 07799 860179. I have lived in Cotgrave since 1990 and grew up in Rushcliffe. We live in a great part of the county and country - a special mix of rural life but with good access to towns and cities such as West Bridgford, Nottingham, Leicester, Newark and beyond. This is especially so now thanks to the long awaited dualing of the A46, which many of us campaigned for many years. And it is fantastic that the A453 is now a dual carriageway thanks in no small part to a £20m kick start investment from Nottinghamshire County council - a policy that my colleagues and I were responsible for when we ran the council from 2009-2013. I was also proud to oversee the naming of the road to Remembrance Way, responding to a public campaign. I am here to help and advise residents and do my best to ensure that needs and enquiries are dealt with speedily and as well as possible. I regularly attend meetings of the various parish councils, and am easily contactable by email and telephone. Despite the well publicised financial challenges that councils are having to deal with, I still have access to a Councillor Community Support fund. This is used to help groups and societies to carry out their activities. In recent months I have been pleased to help, amongst others: Cotgrave & South Notts Arts Club, Friends of Cotgrave Country Park, Cotgrave & District U3A, Little Kites Playgroup, Cotgrave Colts, Cotgrave Welfare schools pantomime, Cotgrave C of E primary school, Cotgrave Candleby Lane school, Cotgrave youth club, Cotgrave bowls club, Cropwell Bishop primary school, Cropwell Bishop youth club, Cropwell Bishop bridge club, Langar C of E primary school, Robin Hood Cadets and other groups and individuals. In 2009, I became the county council's Cabinet Member for Environment & Sustainability, and from May 2012, when the council returned to the committee system, chairman of the Environmental & Sustainability committee. I had county-wide interest and responsibility for council's policies and procedures in connection with the environment portfolio. This included matters such as household waste disposal, minerals and waste strategies, energy matters, strategic planning and the very popular Local Improvement Scheme (LIS). As someone who is Nottinghamshire born and bred, I feel honoured to carry these roles out. Unfortunately my party lost control of the council in 2013 so I am now opposition spokesman for Environment & Sustainability. I continue to do my best for my constituents. 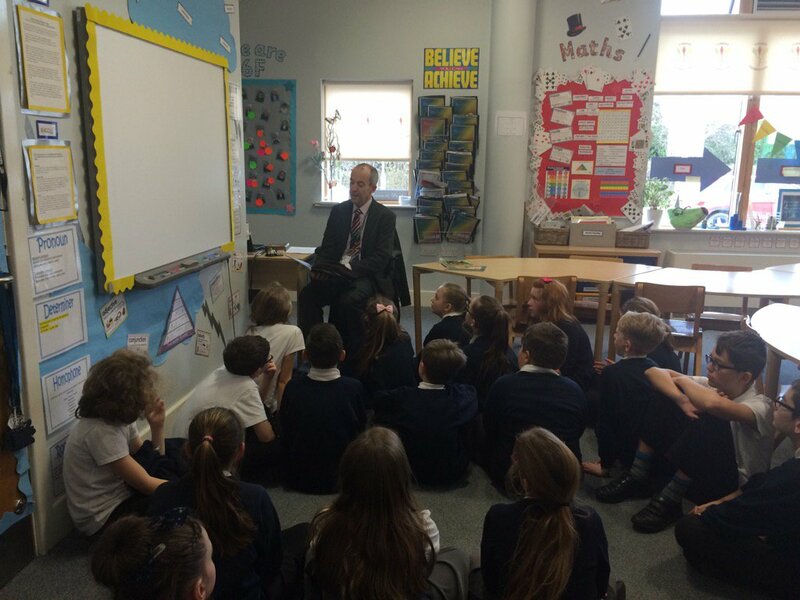 I am still a governor at Candleby Lane school, having previously been chairman of the old infant school governing body and was very much involved with the plans for CCLS, and work closely with other schools in the patch and our parish councils. Cotgrave and area now see very low levels of reported crime. However, we mustn't and won't become complacent. It is very important that any issues of crime or antisocial behaviour is reported. I know that sometimes, you might think there is little point, but it if crime isn't reported, then it's not officially known about. There are two main ways of reporting non-urgent issues - call 101, or if you wish to remain completely anonymous, use Crime Stoppers website or phone 0800 555111. Reading to classes at Candleby Lane School. All these different councils - what do they do? They all have different roles and responsibilities. County councils are responsible for services across the whole of a county, including education, transport, planning, public safety, adult health and social care, libraries, waste management, trading standards, country parks. Borough/district councils - rubbish collection, recycling, council tax collections (on behalf of all the councils) housing, planning applications and local plans, environmental health, leisure, dog wardens. Parish/town - allotments, community parks/play areas, grants to help local organisations, consultation on neighbourhood planning, street litter/dog mess clearing. As I write, the sun is shining, the sky is blue and temperature warm. Can't see it lasting! It's only a week or two since we had very heavy rain, and we were all affected one way or another. Prior to that was the snow - something we are not really used to. Also affected were the roads, and it is a constant battle to get repairs/potholes sorted out. The state of the roads is the main complaint and comment that I receive, and I share everyone's thoughts about them. It's a county and indeed country wide issue. Basically over the years, not enough investment has been put into maintaining the roads, especially this part of the county, and now many are literally falling apart. Most local roads here are maintained by or the responsibility of Nottinghamshire County Council, and I am regularly pursuing them for our area. As we all know, money is tight, but fortunately my colleagues and I agreed and approved an extra £20 million pounds for pothole repairs around the county, at this year's Budget. This is on top of the £100 million or so roads budget. It's a shame that the Labour party didn't support this, especially as for the last 38 years or so (apart from a brief four years between 2009-2013) they ran the county council, managed to increase the council tax by over double in just nine years, yet plainly didn't spend wisely enough on roads maintenance. But plans are in place now to try to get on top of the situation. We can all play out part by reporting potholes very quickly on the online system. I do this a lot and would encourage you to report any holes - don't worry if you think they have already been reported - best to report more than once than not at all. Click here to report online. Very good report/article in the Nottingham Post today, all about Cotgrave. (Anyone would think that I had written it!) It describes very well just what we have and will be getting. I was very pleased to join with other representatives of the organisations who are investing in and taking action to improve Cotgrave Centre with the new multi service building (Rushcliffe Borough Council, Nottinghamshire Police, The Belvoir Health Group and Nottinghamshire County Council) at the site of the new MSC which is now well under construction. The Nottingham Post reported it here. This also links in with the 15 new commercial units that have just been built at Colliers Way - here's an Evening Post report about those. Flytipping - only in this country? It annoys all decent people... Whether it's an old fridge, mattress, rubble, general household waste etc. But sadly and annoyingly, it looks as if it is increasing. There could be various reasons for this, including the rather bizarre and unhelpful need to have to register your details to use the local tip (West Bridgford) and in the good old days, Langar, until that was closed a year or two ago. But also I'm afraid there are some people who even if there was a tip next door, are still minded to dump waste for someone else to clear up. And who clears it up? Well in our area it's Rushcliffe Borough and their Streetwise service. I've just reported a few cases of tipping via their website which anyone can do. Once Streetwise receive the details, they are usually pretty prompt at clearing the mess up. Interesting article in the Nottingham Post about the new business units above the refurbished shops in Cotgrave. Many of my correspondence and residents express concerns about speeding traffic at various points, which is something I also worry about. Over the years I have managed to get interactive speed signs installed. These are useful in that they remind drivers that they should watch their speed - speed limits are there for safety reasons. The latest one has just been installed, this time on Hollygate Lane. I am very pleased that we have got this at last, and I continue to lobby for more in other areas that we are all familiar with. Talking of speeding and bad road behaviour, I have been talking with the Police about how to deal with the small but annoying group of antisocial motorbike riders - usually you can hear them before you see them. They often ride their illegal/unlicensed bikes on the public roads showing no respect for other motorists or people whose peace they disturb. These all need to be reported, to help bring resources in to blitz them. If you see any such bikes/quad bikes being ridden and used in such ways, please report them to 101. It all helps to add to behind the scenes evidence that is being gathered. Look how well the refurbishment and regeneration of the shops is coming along! I took this photo this evening and it shows the new entrance and staircase that will lead to the first floor offices/business units. Next door the new multiservice building - new health centre, new library, new police station and Rushcliffe Borough Council contact point,is rapidly taking shape. This is all happening, all this work and investment, in Cotgrave - now! Nottingham Post article about the new Green Route. It really is a great place to walk/cycle/horse ride - on our doorstep!! I have just been at the official opening of the wonderful multiuser green route (as detailed below). The Chairman of Nottinghamshire County Council cut the ribbon, along with the Leader of the county council. It was great that lots of users on foot, bicycles and a horse all came too! There will be reports on tonight's local TV news on BBC, Central and Notts TV. This is another great facility for Cotgrave and area. An investment of some £250,000. Our local Police inspector produces a newsletter giving updates of local incidents, trends etc. Here is issue 5 (PDF file) which also includes news about nuisance motorcycles that I have been working with the police about for some time. Nottingham Post article re the new 33 bus service. Buses coming back for Owthorpe Road; new service for Hollygate Park and enhanced new "822" turns into the "33".For the last few weeks, since news of the 822’s demise came through, transport planners at Nottinghamshire County Council have been working to find a solution/alternative service. 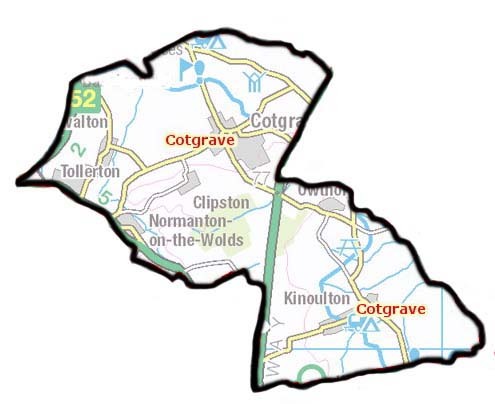 I have been working with my colleague Councillor John Cottee, who chairs the relevant committee at the county council, and we have stressed how important the route is, partly as an alternate choice to the Cotgrave Connection for Cotgrave residents, but also for the village communities along the route. I am pleased to say that we are a major step forward and as well as finding a replacement for the 822, we are using it as a chance to make further much needed improvements for residents. What we now know as the 822 will become the 33. A new provider has come to the table (Nottingham Community Transport) who operate similar services in the county including the QMC Medilink and Park & Ride services. They are going to take on part of the current 822 route and enhance it so that it travels into and out of Nottingham (this is a weakness of most of the current 822 timings). Of particular interest to Cotgrave residents, is that it will also go through Hollygate Park (Colliers Way and Harvest Drive) and on to Owthorpe Road via Ringleas to serve Daleside area (who have been without a viable bus service since the loss of the 822’s predecessor) The route then carries on to Tollerton, Morrisons, West Bridgford, the station and Friar Lane. I know how concerned a lot of people have been about the buses. As you know, we are very much reliant on business plans and viability requirements of the commercial bus companies. As ever, especially nowadays given budget pressures, we must be very mindful of the “Use it or lose it” comments we often hear. I am genuinely hopeful that this proposed new service will mean that more people will be able and want to use the new 33. Now that the HUB is open and up and running, the next stage is the demolition of the old health centre and library building. This process has now started and the area is cordoned off for safety reasons. Everything is being done to keep inconvenience to a minimum. Please do continue to support the shops and businesses - and don't forget to visit the library!! When the old buildings have gone, work will start on the re-landscaping and creating new additional car parking spaces. Plans are also well underway for a fantastic new play area and equipment. The Cotgrave to Radcliffe Greenline is open! In 2012, when I and my Conservative colleagues were the controlling party, Nottinghamshire County Council agreed to take ownership of and invest in the old mineral railway line that runs between Cotgrave and Radcliffe (and goes along to Holme Pierrepont) The idea was to turn it in to a route for pedestrians, cyclists and horse riders, well away from the road and high up to enjoy the views. The council's investment also released some European funding for the project. Between 2013 and 2017, it was all put on the back burner because the new administration (the other lot) at the county council was not interested in pursuing the idea. After we took over the administration in 2017, we again committed to the project. And the great news is that at last, after a few unhelpful local problems, the track is now open. It is already being used by people as intended, and I have received comments such as "It's great, just like the Tissington Trail!" So, why not check it out - have a walk or get the bicycle out like I did! These include the smart and popular Hollygate Park housing which opened up other funding opportunities for Cotgrave as a whole. We have 15x brand new commercial business units recently been built to supplement existing units, and all have already been let out to businesses. The "town centre" regeneration and redevelopment is coming along very well - the main row of shops have new frontages, the upstairs has been completely transformed into fantastic new offices/business units. and next door the brand new health centre, library, police station and Rushcliffe Borough council office, is nearing completion. When this new building is finished and open, the old health centre and library and police station will be demolished, and that area will be re-landscaped, new/extra car parking spaces will be created, along with a brand new play area and equipment. You can see a (pdf) layout plan as to how and where the new landscaping and car parking will be after the old library, health centre and police station are demolished. The other row of shops on the precinct has recently been taken control of by Rushcliffe Borough Council (who have led and are leading the whole project in partnership with the health providers, Nottinghamshire County Council and the police) so expect to see some positive news and action very soon regarding these - they do rather stand out now when compared to the refurbished row. I, along with fellow town councillor pensioner lunch working group colleagues Leo Healy, Christine Jeffreys, Judith Mileham and Steve Gardner, were delighted that this year's Cotgrave Pensioners' Christmas lunch was a fantastic success. This year we held it at the wonderful Nottinghamshire Golf & Country Club (Cotgrave Place, as was). The staff did a fantastic job, the room was decorated beautifully, and over 100 Cotgrave pensioners had a lovely Christmas lunch. We also welcomed pupils from Cotgrave Church of England Primary School, who sang carols to us - they did really well! We must also acknowledge and thank Lightsource Solar Farms, who provide the grant to Cotgrave Town Council to enable us to organise and manage this event. The new multi-service building is open! Great news. The new multi-service building, part of a multi million pound investment in Cotgrave, is now open. I was delighted to attend with the other partner organisations on Friday 9th November the opening of the brand new library, the police station, health centre and Rushcliffe contact point. It's great - do go along and see. I've been involved in the meetings and plans for over ten years with this, and it is wonderful to see it all coming to fruition, along with the refurbished shops. And there is more to come! The existing/old library and health centre will soon be demolished and that area will be landscaped along with new car parking spaces and a brand new children's play park. Here's a report from the Nottingham Post. One thing that really annoys me and the vast majority of our residents, is the disgraceful and disgusting fly tipping that some antisocial characters carry out. We all know that there are some spots that "appeal" to these people, one of which was on the old A46. 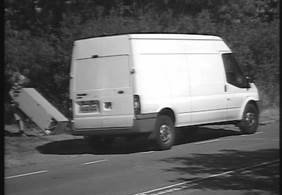 Following numerous complaints from the public to me and to Rushcliffe Borough Council, hidden cameras were installed, and they did their job - caught someone red handed, who was duly dealt with at the Magistrates Court and fined. What's more, this guy was dumping fridges that innocent members of the public had paid him to take away. Unfortunately, he lives in Cotgrave - shows how much he cares for the area. Wow! What a fantastic experience with the Tour of Britain coming through our area! The build up, then seeing the support cars and teams coming through, then the riders. OK, so the bikes pass through very quickly, but what a great turnout of people to watch, and how fantastic to see all the bunting, decorations and yellow bikes. Well done to all - Nottinghamshire County Council, Rushcliffe Borough Council, who negotiated and got the route agreed, and our local parish councils who did so much to get the word out and to lead with the decorations. And to residents who decorated their houses and gardens. Amazing timelapse film showing the transformation of the Cotgrave shops and creating the business units/offices upstairs. Great! Don't forget that we have a good active and growing youth club in Cotgrave. If you, your children or friends are not aware of it, please check it out. Activities are held both at the leisure centre and also various venues and trips out. Here are some further details - click the link and it will take you to the Cotgrave Youth Club page - please use and support the club! They are also grateful for help from parents and volunteers as well. It is also pleasing to see the follow-on and good working with Positive Futures. I was also delighted to be asked to judge a recent artwork competition that they held - not easy to pick the winners - they were all great! Promoted and published by Richard Butler, 1 Church Court, Cotgrave, Nottingham NG12 3QW, on behalf of Richard Butler. Promoted by Graham Smith MBE, on behalf of Richard Butler, c/o Rushcliffe Conservative Association, 17-19 Rectory Road, West Bridgford, Nottingham NG2 6BE.